I remember during my half a year stay in Beijing, I would constantly dread going to the bathroom during school hours. Not only are most of the toilets there on the floor but they stink so bad even if there were cleaners every so often. One time, the attendant saw my facial reaction when I entered the bathroom. She brazenly said out loud in Mandarin (thinking I couldn't understand what she was saying) *Where do you find a toilet that is not stinky? * since I understood what she was saying I said out loud *In my house in the Philippines! * She looked surprised. Having an OC mom, you can say that I have set certain standards when it comes to a clean bathrooms. Yes, I confess that I use a multiple of products for cleaning the bathroom. Mind you, I know how to clean a bathroom. There was a class in ICA that taught us how to clean the whole house. Let's just say that I was very attentive then and I've kept those learnings with me until now. I confess that I have never used #DomexPH before. I know the brand and see it in my supermarket run. I have held them in my hands and almost put it in my cart, but I hesitate and return it on the shelf. I am what you call a *creature of habit*. I like using products that I have tried and tested - I rarely try a new product just for kicks, yeah - that's me. 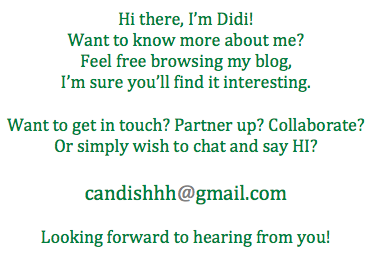 So with me, a sample really means a lot - it can make or break me with a *love* of a product. Last week, I learned something new and that is that #DomexPH is already three products in one. It's a thick bleach that does the work of three different products that I buy individually. It's a toilet cleaner, an all around cleanser, and a bleach! 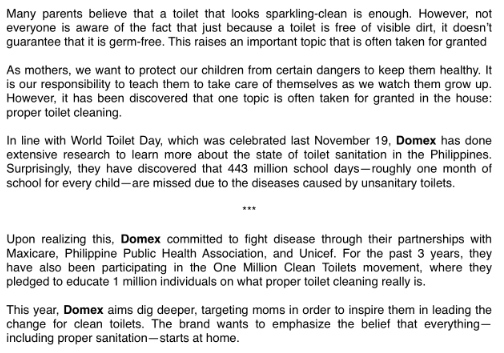 I also learned about #DomexPH's *1 million Clean Toilets* campaign. It totally makes sense to clean toilets - because let's face it - it's not the cleanest part of the house. It's nice too to be able to start in our homes - to make our family members aware that proper sanitation starts at home, with us!